In short, if you want to watch more TV, the universe won’t bother you. If you want to do work that matters, it’s going to be a fight. "Work that matters" is in the eye of the beholder. I know that, when I decide what that is and focus on it, it gets done. It's how my old Check Point FireWall-1 FAQ got built. It's how two books got published. It's how, even during the times where my heart wasn't always in it, I've managed to evolve and stay employed at Nokia for 10 years and Check Point for nearly 7—a man and his family have to eat and have a place to live, after all. I suppose I should consider myself very lucky. A lot of people have never experienced that sense of purpose that drives them to do anything more than watch life go by. And yet, I feel like I need to go back to the well for another taste, because even though it is hard work, it pays off in the end. Information Security is where I make my living. In an increasingly digitized and connected world, it is pervasive. There's a lot I have to say about it that maybe other people are saying, but maybe not the right way or to the right people. These conversations are taking place in board rooms, in the media (both traditional and social), and even amongst the masses as yet another major retailer gets their credit card data compromised. I've spent many years helping Nokia/Check Point customers in a post-sales capacity. I've also been a bridge between customers, sales, and product development. Each one of these players speaks a different language (kind of like the difference between The Queen's English and whatever us Americans speak), and I'm adept at translating as needed. The last few years, I've started getting more directly involved in the sales process. I've been working with individual customers through specific sales engagements that help identify the areas of greatest risk and come up with a written plan to improve their security posture. It has taken a couple of years to turn this into a framework that contextualizes the findings and recommendations, but more importantly, can drive change. It has been great to work with individual customers. With a different platform, I could have a greater, more meaningful impact to more organizations. How I move forward is the subject of many thoughts I am not yet ready to elaborate on publicly at the moment. What I can say is that this matters. I know it's not going to be easy to see this through, but I'm committing myself to do it. The fact that most experts talking on TV and writing for online “news” media cannot swim in the critical deep end of the subjects in which they claim expertise is masked by the shallowness of the medium in general. The analysts and experts who are invited to talk on TV about politics spend more time whitening their teeth than they do weaving nuance. We are living under a media regime where a debate moderator can ask an absurdly complex question like “What will you do about poverty?” and expect it to be answered in less than a minute. Comcast-owned NBC would not dare upset its nightly prime-time sitcom lineup with in-depth analysis that might upset their Comcast-owned bottom line. Vox is not going to Voxplain how Comcast captures the media and cable markets both by lobbying for regulative barriers that prevent competition. I've long questioned the kinds of things our so-called "news" covers. Years ago, I started asking the question "why is this news" and mostly stopped caring about it. When the Internet became mainstream, I had a way to find other, less mainstream answers for what was going on in the world. Sources with more nuance, more details, and differing points of view. Clearly, something is missing in the media. It's hard to get into the "why" of this question without veering off into conspiratorial waters. It’s a narrative I occasionally see being played up by the media, usually by attacking the messenger. The good news is that I'm hearing more people starting to question the news, particularly when they cover topics they have first-hand knowledge on. The obvious followup question is: if they're wrong about that, what else are they wrong about? The truth for any subject is out there to find. You probably won't find it in the mass media, though. We call this new math, but it isn’t new at all. In fact, it has been around for a very long time. It’s called number sense. And it’s the way mathematicians have been thinking about numbers for centuries. Mathematicians are insanely smart people. I should know, I got my Computer Science degree in a Math department at a University. They also don't think like normal people do. I should know that, too, as I am often accused (rightfully so) of thinking about things differently. If I believe what this piece is saying, Common Core math is trying to impart the math wisdom of these really smart people onto the masses. Instead, it comes off as really confusing, even to kids who actually know how to do math. One of my kids who is smart with numbers was deploying different tricks to solve these problems and found whatever it was they were teaching in Common Core confusing. My wife had to re-teach our children basic math after being traumatized by Common Core in elementary school. It seems to be we are going about this the wrong way. They should teach the basic, tried-and-true methods first, then supplement with number sense to show other, more memorable ways to solve the problem. Or maybe encourage students to come up with their own methods to achieve the same answer and allow them to teach it to their peers. Of course, there are some people who just don’t have any number sense whatsoever and won’t no matter how you teach it or who teaches it. The Problem Isn't With Twitter, It's With Us. Abuse is killing the social web, and hence it isn’t peripheral to internet business models — it’s central. It has significant chilling effects: given a tipping point, people will simply stop using a network, and walk away…and that appears to be what’s happening with Twitter. Abuse is just as central to tech that connects people as selling beef that isn’t contaminated with salmonella is to an industry that feeds people. For the simple fact is that no one wants to spend their life being shouted at by people they’ll never meet who are angry not at them but at the world for things they barely even said to people they barely even know. This problem is not unique to any given social network. The real problem is us, the humans that use social media. Some clearly find joy in imposing their world view on others to the point of abuse. Many cannot stand the thought of their world view being challenged, much less be wrong. Lots and lots of squabbling is the result. This problem is not unique to Twitter. It’s a problem on any social network with any sort of critical mass. I’ve seen this cycle play out over and over again across many services and several decades. It also happens in person, but there is one thing we get in face-to-face interactions: social cues that have evolved over many centuries. Social cues that a particular sort of behavior is not acceptable. People will either knock it off or suddenly find themselves without many friends, sorting into the same kind of tribes we see and decry on social media. Humanity hasn't been able to come up with better solutions to these problems in millennia. What makes us think the socially inept folks that develop the social web can solve these problems? Even so, those very same social cues we rely on in face-to-face conversations should have social web analogs and, at the very least, those cues can be developed and refined. Bottom line, this is not a social web problem, it's a human problem. Last night, I did not treat the vegetable slicer with the appropriate respect and ended up lacerating my index finger on my right hand. I suspected it might need stitches, but I waited until this morning to call my doctor's clinic and ask. They said: go to Urgent Care. So I did. The nurses there cleaned up the wound and stitched me up. If you're interested, you can see the semi-gruesome photo of my stitches on Instagram. The downside of this means I will be without a properly functioning index finger for the next week and a half. It's amazing how much you use that finger. It's even more amazing your brain mostly knows how to compensate for the nonfunctional digit as well. Where it is having noticeable impact is in my typing, mostly because I do that more than anything else. My middle finger is being used a whole lot more right now, especially on my iPhone. It doesn't seem to have affected the speed at which I type, though it has mildly increased the error rate, but I'm mostly managing. We'll see what other things I notice over the next several days. In my last post, I talked about making a fresh start online. I've started taking some steps to do exactly that and it starts with Twitter. I've been on Twitter since it was made public in 2006. I have tweeted a TON of things over the last 9 years, most of which is probably not relevant anymore. I have also accumulated several Twitter accounts over the years, accounts that probably should have been removed long ago, and I deleted those accounts. I did not want to delete my main Twitter account, I just want to delete everything I've posted. How do you do a mass purge of tweets? Deleting tweets one by one when you only have a few is fine—I did this on another account—but how about when you have more than 40,000 tweets like I did? There are actually a number of tools out there that claim to do this. However, if they are only working with the Twitter API, you won't actually delete all the tweets. This is because the various API calls that query your most recent tweets will only show your 3200 (or so) most recent ones. If you delete all of those (as many tools do), then older tweets will still exist in the system. If you happen to know the tweet ID, you can still query them. However, I have found a tool that runs on Windows and can actually delete all your tweets. It's called Twitter Archive Eraser. It's a free tool that runs on Windows-based system that will work with an export of your Twitter archive and delete all your tweets, one by one. I actually use it on my main Twitter account and it worked great, deleting more than 40,000 tweets in around 9 minutes. For accounts that have 3200 tweets or less, you can use any number of websites, iOS, or Android apps out there. The one I chose, based on a recommendation from Stefan Constantinescu, is called Delete Tweets. It has a big red button that does what it says: deletes all your tweets. You can pay $2.99 for a "pro" version that will give you some filtering options (i.e. you can choose to delete only some tweets). You can run it regularly from your iOS or Android device to reset your tweets back to zero. The next step is to do this with Facebook. One of the guys I've followed for years on the Internet has taken what some might call a drastic approach: he's purged his Twitter account of tweets. Given the ephemeral nature of Twitter, this actually seems somewhat appropriate to do. Also, things that you said years ago in the heat of the moment, things you may not say or think today, could easily come back to haunt you. I'm thinking of taking this a step further and doing some culling of all of my various online presences. I've been on the Internet more than 20 years and I've managed to bring forward a ton of content—content that, quite frankly, may not entirely be relevant anymore. I've also got far too many presences on the Internet. Some of them it makes sense to continue to maintain, others not. I almost want to blow it all up and start over. Or maybe seriously cull what's out there, starting with my Twitter accounts. I have a dozen of them. I actually deleted four of them today and completely emptied the tweets out of another. Has anyone actually gone through this exercise of cleaning up their online presence or nuking it entirely? While I'm sure I can figure out the mechanics of actually doing it, anyone have any tips or tricks they want to share? I must do something like this unconciously as there are so many conversations or situations where I cannot recall the exact details, but I can usually remember the key takeaways. This generally works well for me, though taking a moment to write it down couldn't hurt. That said, people might have different ideas about what is important. This is where I sometimes run into trouble, but as the article suggests, you'll get better at figuring this out over time. Since I got my CPAP machine, I've started noticing how many other people have them as well. How do I know? This unassuming grey bag. 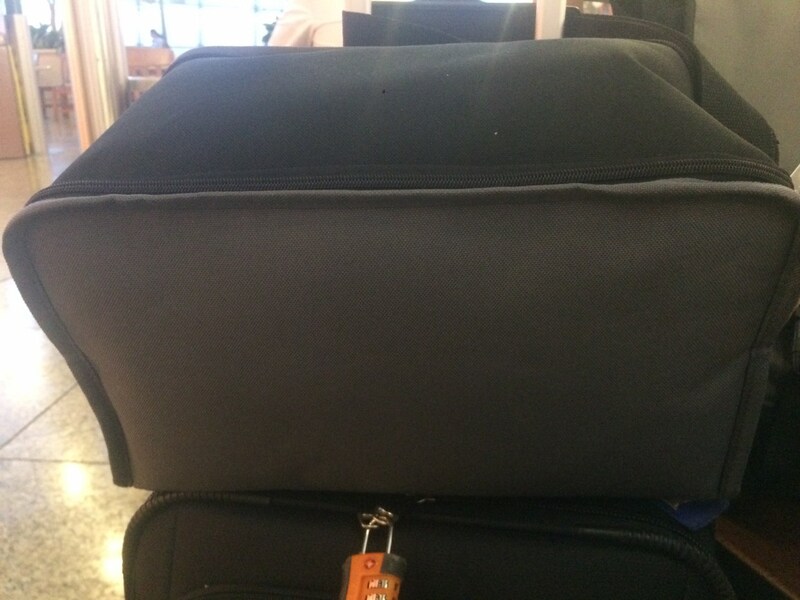 I notice at least one such bag every time I'm in an airport. It's possible I saw such bags before, but since I didn't know what was in them, I didn't think much of them. Now, because I carry one of these bags myself when I travel, I know. This morning I encountered someone someone right in front of me in the TSA line. He saw my bag and said "better make sure we don't get our CPAPs mixed up." Agreed, that would be an unpleasant surprise. "A REMstar, right? ""Yup," I said. It's like being in an exclusive club. Granted it's not a club most people would want to be a part of, but if I have to have one, I might as well embrace it. I did something I haven't done before: I got up in the middle of the night to pee and forgot to put my CPAP mask back on. This meant, for a few hours last night, I slept in my bed without my CPAP. This isn't the first night since I got my CPAP that I didn't wear it, mostly because I've had a couple of red-eye flights since then. CPAP usage on an airplane isn't feasible, at least in coach. However, its the first time I've slept in my bed without the mask on since I got it. And, sure enough, I snored. How do I know this? 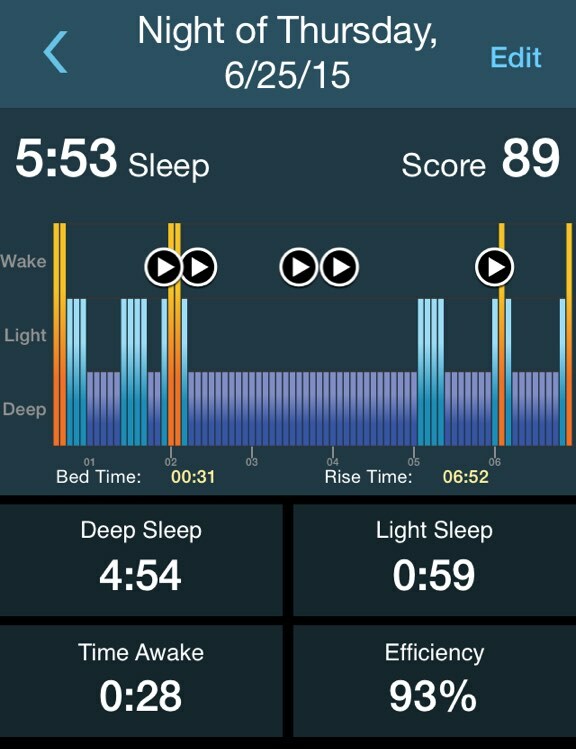 I've been using the MotionX-24/7 app to track my sleep and record sounds that happen while I sleep. Since I got the CPAP, mostly all it picked up was me rolling over and the very occasional quiet snore. Last night, it picked up truly proper snoring. I have no idea if I snored the whole time I didn't have the CPAP mask on or not. I do know the CPAP only works if I wear it.